The Qbe Cirrus Personal Computing Tablet has everything: a keyboard, a mouse, a webcam, Universal Serial Bus and serial ports, PC Card slots, a touch screen, voice recognition, a CD-ROM drive and a smart card reader. But it can't defy gravity. Aqcess Technologies Inc. designed Qbe to be held like a clipboard, but its weight begins to drag after time. 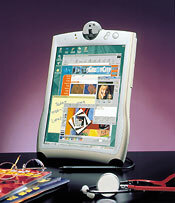 Aqcess Technologies' Qbe tablet is an attempt to put standard computing functions into a novel size. Try holding up a full-length hardback book in one hand for 15 minutes with no other support, and you'll get an idea of how quickly your arm tires out. The most notable feature is the large, 13-inch active-matrix color display with up to 1,024- by 768-pixel resolution. The display also is a highly accurate touch screen. The overall grade comprises scores for three factors: usability (40 percent), features and configuration (30 percent), and performance (30 percent). The lab used ZD's Winstone 99 1.2. For benchmark information, visit www.gcn.com/gcnlab/benchmark. The one downside to the large screen is that when the device is used in a bright office, the display acts almost like a mirror with a dark background. You could literally look into it while you comb your hair. I'm not sure whether that's an example of an antiglare coating gone wrong, but the end result is that the display truly works its best only in dim light. The port station screws into the back like a stand for using the Qbe on a desk. It has a serial and a parallel port, two more PS/2 ports, an external RGB video connection and a second USB port. With the port station, the Qbe is more functional than some desktop systems. The webcam at the top of the Qbe can capture images at a resolution of up to 640 by 480 pixels. But it's inadequate for gathering live video of what's happening in front of the device. Images tend to blur and drop out. For still images, it works fine. The unit's Silicon Motion Lynx3DM graphics chip has 8M of video RAM but doesn't render 3-D well. In the ZD benchmark tests, the Qbe could barely render eight 3-D frames per second even at a low texture density.